The transcript of a tense and acrimonious meeting of the House Intelligence Committee has been released -- two days after it took place. The meeting earlier this week, on Monday, laid bare bitter exchanges over the public release of dueling memos on alleged surveillance abuses by the FBI. "If it turns out the majority memo is wrong, there will be hell to pay. If it turns out that the minority memo is wrong, there will be hell to pay," said Rep. Jim Himes, D-Connecticut, according to the transcript. The 51-page, unclassified transcript recorded the proceedings leading to the vote to release the controversial, classified, four-page memo written by the staff of Chairman Devin Nunes, R-California. The committee's Republicans contend their memo, which is based on highly classified intelligence, shows political bias on the part of the FBI in its investigation of members of the Trump campaign. The memo itself has not yet been released. "Colleagues, I truly believe this is a step too far ... And this is a slippery slope I don't think any of us want to see happen to our intelligence community," argued Rep. Jackie Speier, D-California. The memo is now with the president, who has five days to block its release. At the same meeting, Democrats on the committee introduced a 10-page rebuttal memo said to counter much of the material included in the majority's document. The committee voted -- again along party lines -- to release the minority's memo to members of the House but against making it available to the public. The committee's Republicans said they would revisit making the minority's memo fully public in the coming weeks. At least some of the details in both memos are said to be based on intelligence that is so highly classified that it is considered "Gang of Eight" material, available to only a select few congressional leaders. Only two committee members – Ranking Member Adam Schiff and Rep. Trey Gowdy, R-South Carolina, had reviewed the underlying intelligence. The release of the memo is opposed by the FBI. Earlier Wednesday, the FBI issued a rare statement warning against the memo's release, saying, "As expressed during our initial review, we have grave concerns about material omissions of fact that fundamentally impact the memo's accuracy." FBI Director Christopher Wray, along with Deputy Attorney General Rod Rosenstein, asked White House chief of staff John Kelly not to allow its release. The memo details allegations that the DOJ and FBI abused authorities under the Foreign Intelligence Surveillance Act (FISA) around the time of the 2016 presidential campaign. Wray and another FBI official went to Capitol Hill to meet with Rep. Nunes and review the memo on Sunday evening. On Monday, a second meeting took place between committee staff and two other FBI officials – the head of counterintelligence and a FISA lawyer. In a move that effectively pits the word of the committee against that of the FBI, a committee spokesman maintained that during reviews of the memo by Wray and two other FBI officials, "they did not cite any factual inaccuracies." 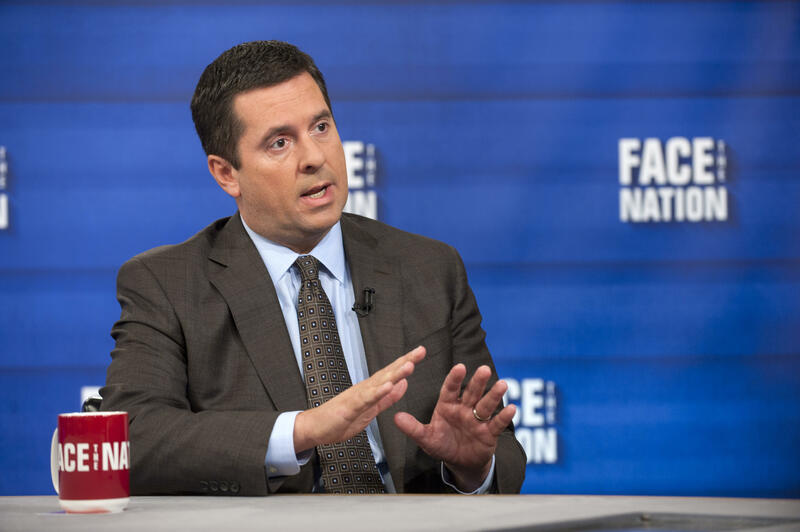 And in a separate, stinging statement in response to FBI, Nunes said on Wednesday, "…[I]t's no surprise to see the FBI and DOJ issue spurious objections to allowing the American people to see information related to surveillance abuses at these agencies. The FBI is intimately familiar with 'material omissions' with respect to their presentations to both Congress and the courts ..."
In the committee's transcript, Rep. Eric Swalwell, D-California, asks Chairman Nunes pointedly whether the FBI is "okay with" disseminating the majority memo to the public. Nunes avoids directly answering the question, responding, "Our goal was to make sure that we were not going to disclose any issues of national security, and we believe that we have met that threshold." In another heated exchange, Rep. Mike Quigley, D-Illinois, peppers Nunes with a series of questions about whether any part of the process was coordinated with the White House. "Let me ask you another question with the greatest respect," Rep. Quigley said. "When you, as the majority, conceived of doing this memo for release to the body and to the public, the preparation, the thought of doing it, the consultation of it, was any of this done after/during conversations or consultations with anyone in the White House? Did they have any idea you were doing this? Did they talk about doing this with you? Did they suggest it? Did you suggest it to them? Did you consult in deciding how to go forward with this before, during, and after this point right now? "I would just answer, as far as I know, no," Nunes responds, before noting the minority has been reluctant to investigate matters of FISA abuse. "Mr. Chairman," Rep. Quigley continues, "does that mean that none of the staff members that worked for the majority had any consultation, communication at all with the White House?" "The chair is not going to entertain a question by another member," Rep. Nunes responds, and moves on. In April, Nunes, who served as an official on President-elect Trump's transition team, stepped away -- but never officially recused himself -- from the committee's ongoing investigation into Russian meddling in the 2016 election, while the Office of Congressional Ethics looked into charges he may have made unauthorized disclosures of classified information. The charges were filed by two left-leaning watchdog groups after Nunes told reporters Mr. Trump's personal communications might have been picked up by the intelligence community through "incidental collection" a month earlier. The Ethics Committee has since cleared Nunes of the charges. The White House has signaled that President Trump supports making the majority's memo public, though the timeline for doing so remains unclear. On a Fox News radio program, White House chief of staff John Kelly said he had personally viewed the memo and that, "It'll be released here pretty quick, I think. And the whole world can see it." Kelly's remarks came the morning after the president himself, soon after delivering his first State of the Union address, was overheard telling a Republican congressman he would release the memo, "100 percent." Democrats have expressed concern that Republicans are using the memo to undermine the credibility of the FBI and DOJ as special counsel Robert Mueller investigates Russian election meddling and any ties to Russia. Meanwhile, Republicans have insisted the memo has nothing to do with Mueller's probe.